One of the most important steps in preparing your home to sell is staging. This step can be as simple as decluttering to the more costly approach of hiring a stager. Almost every home can benefit from decluttering first and foremost. It may be hard to adjust to at first, but the payoff can be enormous. In the above picture the room is mostly clean and presentable for guests, but it is a different story for buyers. This room is full of things and personal items which can be a distraction to buyers. Rather than seeing the amazing built-in book shelf one’s eye wanders to all of the objects that fill it. The personal items tell the buyers a lot about the owners. The myriad of books suggests the owners are educated and often the titles can suggest what the owner’s occupation is. The family photos and toys give a sense of the size and age of the family. Exotic knickknacks might suggest the family travels a lot. By seeing all of this the buyer can start to imagine what the sellers are like and therefore what kind of negotiating power they may have. With a growing child many buyers assume the sellers need more space. If a local company is relocating and the buyer realizes that the seller works there the buyer might get a sense of how quickly the seller needs to move. If the buyer is acquainted with the seller personal photos will immediately tell the buyer who he is dealing with. Personal items can also give a buyer a sense of how frugal or excessive the seller is, which can lead the buyer to conclusions about how flexible the seller may be in negotiations. Whether the buyer is correct or not in these assessments he is likely to use them in his negotiation strategy. 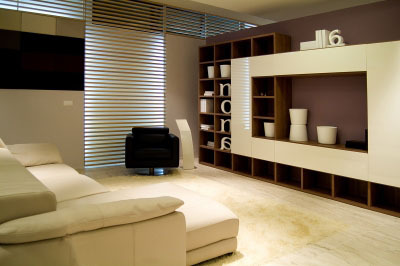 By removing the clutter and personal items, as in the picture above, the seller takes the negotiating power from the start. There is nothing in the room to clue in the buyer on who the seller is or why they are moving. The only thing to focus on is the product, the home. 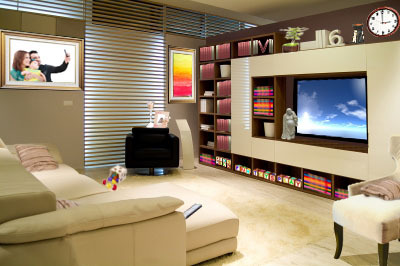 The built-in bookshelf is highlighted with a few generic decorations that bring out the color in the tile and the t.v. has been turned off and tucked away to a place where it is hardly noticeable. Looking at this room through the eye of a buyer your focus is brought in to the most important aspects, how much space is in the room, how is the lighting, what does the furniture that stays with the room look like. By keeping most of the shelves empty the buyer will also have an easier time imagining his own possessions in it, to figure out if everything will fit. Executive Coordinator for Terri Buseman As a native Chicagoan Molly Heyen has an intimate knowledge of the life and culture of the city. Her meticulous organizational skills gives her the ability to create systems that help others prioritize their needs and see the big picture. Her involvement in Toastmasters has taught her how to complete projects in a timely and thorough manner with others on a voluntary basis, when members of the team have differing schedules. Her persistance and drive have been at the heart of her every success in Real Estate, from funding her broker license, to helping renters secure a property that was not on the market, to working with Terri Buseman—just ask us about that story! Molly likes to spend her free time with her husband, taking road trips in their Corvette, wakeboarding with friends, cross-country skiing, playing pool, and learning about whiskey, cigars, and wine. Thank you. That is very kind!